The mycobacterial cord factor trehalose-6,6-dimycolate (TDM) and its synthetic analog trehalose-6,6-dibehenate (TDB) are potent adjuvants for Th1/Th17 vaccination that activate Syk-Card9 signaling in APCs. In this study, we have further investigated the molecular mechanism of innate immune activation by TDM and TDB. The Syk-coupling adapter protein FcRγ was essential for macrophage activation and Th17 adjuvanticity. The FcRγ-associated C-type lectin receptor Mincle was expressed in macrophages and upregulated by TDM and TDB. Recombinant Mincle-Fc fusion protein specifically bound to the glycolipids. Genetic ablation of Mincle abolished TDM/TDB-induced macrophage activation and induction of T cell immune responses to a tuberculosis subunit vaccine. Macrophages lacking Mincle or FcRγ were impaired in the inflammatory response to Mycobacterium bovis bacillus Calmette-Guérin. These results establish that Mincle is a key receptor for the mycobacterial cord factor and controls the Th1/Th17 adjuvanticity of TDM and TDB. The development of recombinant subunit vaccines has been hampered by the lack of safe and effective adjuvants for human use. For many years, research into adjuvants was neglected and only recently has been invigorated by the discovery of pattern recognition receptors (PRR) for microbial ligands (so-called pathogen-associated molecular patterns) on APCs. Modern, molecularly defined adjuvants may be used to induce appropriate types of immune responses through engagement of specific receptors and pathways. TLRs are the best characterized family of PRRs and recognize a wide spectrum of pathogen-associated molecular patterns from different pathogens, including mycobacteria (1). In the last few years, several C-type lectin receptors (CLECs) were shown to act as PRRs that activate APCs through a pathway comprising the kinase Syk and the adapter proteins Card9, Bcl10, and Malt1 (2, 3). Dectin-1, the first member of the CLEC PRRs, binds β-glucans from yeast cell wall and directly recruits Syk (4–6). The CLEC Dectin-2 and Mincle both require the adapter protein FcRγ for Syk activation (7–9), whereas others associate with the Dap12 adapter molecule (10). The binding specificity of CLEC is not restricted to fungal carbohydrate structures but encompasses various chemical structures and microbes, including dengue virus particles (Clec5a), the ectoparasite house dust mite (Dectin-2) (11), and the nuclear ribonucleoprotein SAP130 (Mincle) (9, 10). Of interest, Syk-Card9–dependent APC activation by triggering of Dectin-1 and Dectin-2 induces Th17 immunity to fungal infection (7, 12). CFA is a suspension of killed Mycobacterium tuberculosis in mineral oil that has been used experimentally for many decades. The mycobacterial cell wall glycolipid trehalose-6,6-dimycolate (TDM), also known as cord factor, and its synthetic analog trehalose-6,6-dibehenate (TDB) are effective adjuvants for induction of protective T cell immunity by recombinant proteins from M. tuberculosis, Chlamydia, and other pathogens (13–15). We have previously investigated how these glycolipid adjuvants elicit protective immunity. The development of a mixed Th1/Th17 response by TDB/TDM-containing adjuvants is linked to protection after challenge with M. tuberculosis (4, 14). APC activation by TDB and TDM in vitro is independent of TLR/Myd88 signaling but instead requires the Syk-Card9–Bcl10-Malt1 signaling axis, which is also essential for adjuvanticity in vivo. We excluded Dectin-1 as an essential receptor for TDB and TDM, but obtained evidence in vitro that the adapter protein FcRγ may couple a receptor protein to Syk-Card9 signaling (4). In this study, we show that the FcRγ-coupled CLEC Mincle binds the glycolipids TDB and TDM, is essential for activation of macrophages and adjuvant activity, and plays a nonredundant role in the macrophage response to intact mycobacteria. TDB, TDM, CpG, and dimethyldioctadecylammonium (DDA) liposomes have been described (4). Myd88−/− and Fcerg1−/− (referred to as FcRγ−/− mice in this paper) were used with permission from Drs. Akira and Takai, respectively (16, 17). Card9−/− and Mincle−/− mice have been described (2, 18). Animal experiments were approved by the Regierung von Oberbayern. Mice were immunized s.c. with Ag85B-ESAT-6 (H1) mixed with adjuvants as described (4). Mycobacterium bovis bacillus Calmette-Guérin (BCG) glycerol stocks were prepared at a density of 1.7 × 109/ml. Escherichia coli (DH5α) and Staphylococcus aureus ATCC R5923 were cultured on blood agar, picked, and adjusted to a density of 108/ml before freezing. All bacteria were diluted in complete DMEM before use for macrophage stimulation at the indicated multiplicity of infection. Generation of macrophages from bone marrow and stimulation with glycolipids was done as described (4). The glycolipids TDB and TDM were coated directly to cell culture plates following the procedure described in Ref. 19. Measurement of nitrites, cytokines, and mRNA expression was done as described (4). TDB, TDM, and curdlan were coated onto 96-well cell culture plates at 40, 10, and 2.5 μg/ml. After washing and blocking with 3% BSA in HBSS, supernatant of Mincle-Fc–transfected HEK-293 cells was added at a dilution of 1:4 in blocking buffer. Following incubation at 4°C overnight, plates were washed three times, bound protein detected by incubation with anti-human Fc Ab conjugated to peroxidase, washed again, and developed with ELISA substrate. Previously, we demonstrated that the glycolipid adjuvants TDM and TDB activate the Syk-Card9-Bcl10-Malt1 pathway in APCs (4). In addition, TDM/TDB-induced NO production is independent of Dectin-1, but requires FcRγ (4). To corroborate and extend these data, we tested whether the expression of G-CSF, IL-1β, and arginase-1 requires FcRγ (Supplemental Fig. 1). As expected, TLR9- as well as Dectin-1–triggered induction was not affected by the deletion of FcRγ, whereas TDB and TDM failed to induce G-CSF and IL-1β expression in FcRγ−/− bone marrow-derived macrophage (BMM). FcRγ also associates with the activating Fcγ receptors [FcγRI (CD64), FcγRIII (CD16), and FcγRIV] that can also bind non-Ig ligands (20). However, although NO production was completely abrogated in the absence of FcRγ, none of the Fcγ receptor-deficient BMM genotypes showed a substantial impairment in NO release (Supplemental Fig. 2). Thus, FcRγ is essential for transcriptional responses to TDM/TDB, but Fcγ receptors are not involved. The adjuvanticity of TDB/TDM is abrogated in Card9−/− mice, including the locoregional inflammatory reaction and the induction of Th1/Th17 biased Ag-specific T cells (4). As FcRγ deletion closely mimicked the phenotype of Card9−/− in BMM, we next asked whether FcRγ is also essential for the induction of cellular immunity to subunit vaccination with the M. tuberculosis fusion protein Ag85B-ESAT-6 (H1) by the adjuvant TDB in vivo. The moderate footpad swelling postinjection of H1 in liposomes alone was not affected by the absence of FcRγ. In contrast, the large increase in footpad thickness in the TDB-containing adjuvant group was almost entirely abrogated in FcRγ−/− mice (Fig. 1A). The induction of IFN-γ–producing T cells was reduced to the levels obtained with liposomes alone in FcRγ−/− (Fig. 1B), and the strong induction of IL-17–producing H1-specific T cells by the adjuvant TDB was completely FcRγ-dependent (Fig. 1C). The similarity between the phenotype of FcRγ−/− and Card9−/− mice indicates that FcRγ is critical for the Syk-Card9–dependent activation of APCs. The lack of residual adjuvant activity of TDB in FcRγ-deficient mice suggested that other adapter molecules or receptors that directly recruit Syk are most likely not involved. FcRγ-dependent adjuvanticity of TDB. Mice were immunized s.c. with 2 μg H1 protein adsorbed to DDA liposomes (250 μg) containing TDB (50 μg) or not at day 0 and day 21. A, Footpad swelling was measured on day 6 with a caliper. Baseline values were subtracted individually for both feet of each mouse. IFN-γ (B) and IL-17 (C) production by lymph node cells after restimulation with H1 (10, 2, and 0.4 μg/ml) for 96 h in vitro. A–C, Mean and SEM of five mice per group from a representative experiment of two to three with similar results. *p < 0.05; **p < 0.01. In our search for a receptor for the TDM and TDB, we focused on the family of CLEC because we had excluded Fcγ receptors (Supplemental Fig. 2). We reasoned that the putative receptor should be expressed in macrophages and mined our microarray datasets from BMM (GSE10530 and GSE10532 in Gene Expression Omnibus, www.ncbi.nlm.nih.gov/sites/entrez?db=geo; see Ref. 4) for expression of CLEC family members (Supplemental Fig. 3). Among the expressed CLECs, Dectin-1 had already been ruled out as a receptor (4); Clec5a associates with Dap12 (10), and the adapter protein coupling Clec4d/Clecsf8 to Syk is unknown. In contrast, Mincle and Dectin-2 stood out because they are FcRγ-associated receptors and were expressed and upregulated in BMM by TDB. In a second microarray dataset, all TDB regulation of CLEC receptors was Card9-dependent (Supplemental Fig. 4). Validating expression of Mincle mRNA by quantitative RT-PCR (qRT-PCR), we observed a complete dependence of the TDM/TDB-induced increase on FcRγ and Card9, but not on the TLR adapter protein Myd88 (Fig. 2A). Mincle can interact with ligands of diverse chemical nature (9, 18, 21). We therefore investigated whether it directly binds to TDM and TDB. A Mincle-Fc fusion protein specifically and dose-dependently bound to TDM and TDB, but not to curdlan (Fig. 2B). These data demonstrate that the mycobacteria-derived glycolipids TDM and TDB are newly recognized ligands of Mincle. Mincle expression, regulation, and binding to TDM and TDB. A, Increased mRNA expression of Mincle in BMM poststimulation with TDB or TDM (4 μg/ml, respectively) for 48 h requires FcRγ and Card9, but not Myd88. Shown are mean and SD of quadruplicate qRT-PCR data. B, Binding of recombinant Mincle-Fc fusion protein to glycolipids and curdlan. TDB, TDM, and curdlan were coated at 40, 10, and 2.5 μg/ml in 96-well plates. 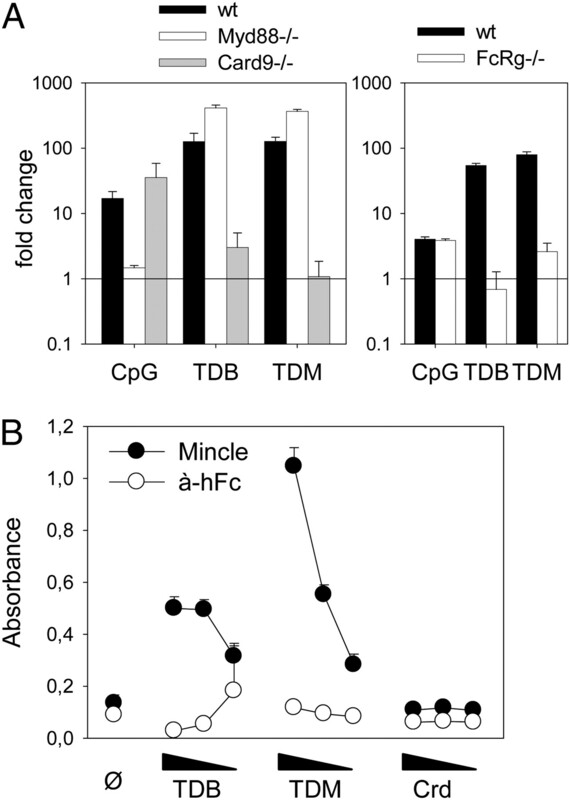 Binding of Mincle-Fc was detected with peroxidase-conjugated anti-human Fc Ab. Mean and SD of triplicate wells from a representative experiment of two. Mincle−/− mice have been generated independently by two groups (18, 21). We first studied Mincle−/− macrophages in vitro and observed a complete abrogation of the TDM/TDB-induced expression of G-CSF and IL-6; in contrast, the response to curdlan or CpG was unaltered (Fig. 3A, Supplemental Fig. 5). Likewise, the production of NO by IFN-γ–primed BMM specifically required Mincle when the cells were stimulated with TDM or TDB (Fig. 3B). The role of Mincle in generating the adjuvant effect of TDB in vivo was studied again using the H1 subunit vaccination protocol. The cellularity in the draining lymph node was significantly reduced in Mincle−/− mice when TDB was the adjuvant, but not when CpG was applied (Fig. 3C). The functional analysis of the T cell response to H1 revealed a significantly impaired Th1 response for TDB but not CpG or liposomes alone (Fig. 3D). Robust IL-17 production postimmunization was only observed when TDB was included as adjuvant and strictly depended on Mincle (Fig. 3E). Thus, the deletion of any component of the Mincle-FcRγ-Card9 signaling pathway destroyed the capacity of TDB to drive Th1 and Th17 immune responses to protein Ag in vivo. These data identify Mincle as an innate PRR that is targeted by TDM and TDB and controls the generation of cellular immunity known to be linked to protection against mycobacterial infection (4). 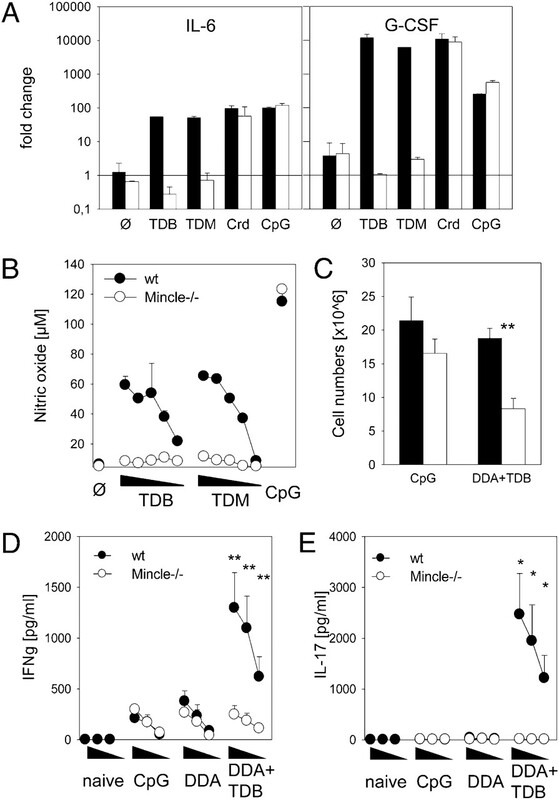 Mincle is required for macrophage activation and Th1/Th17 induction by TDM and TDB. A, Mincle−/− and wild-type BMM were stimulated with plate-coated TDB (5 μg/ml), TDM (5 μg/ml), or curdlan (500 μg/ml) or with CpG (1 μM) in solution for 24 h. Changes in the expression of G-CSF and IL-6 mRNA were analyzed by qRT-PCR. Mean and SD of quadruplicate samples from a representative experiment of three performed. B, As in A, except that glycolipids were titrated (0.015–4 μg/ml), IFN-γ (10 ng/ml) was added, and the supernatants were analyzed for the accumulation of nitrite using the Griess assay. C–E, Mice were immunized once s.c. at the base of the tail with 2 μg H1 protein adsorbed to DDA liposomes containing TDB or not, or with H1 mixed with 5 nmol CpG ODN at day 0, and sacrificed at day 7. C, Cell numbers in the draining inguinal lymph nodes. Production of IFN-γ (D) and IL-17 (E) by 3 × 105 lymph node cells/well restimulated with H1 (10, 2, and 0.4 μg/ml) for 96 h in 96-well plates. Mean and SEM of data obtained in three independent experiments: n = 8 (Mincle−/−) and n = 10 (wild-type) for DDA; n = 15 for DDA plus TDB; n = 7 for CpG). *p < 0.05; **p < 0.01 in Student t test. The cord factor is a virulence factor of pathogenic mycobacteria that is sufficient to cause granuloma formation and tissue damage (22). Given the abundance of TDM in the mycobacterial cell wall, binding to Mincle may occur when macrophages encounter mycobacteria. 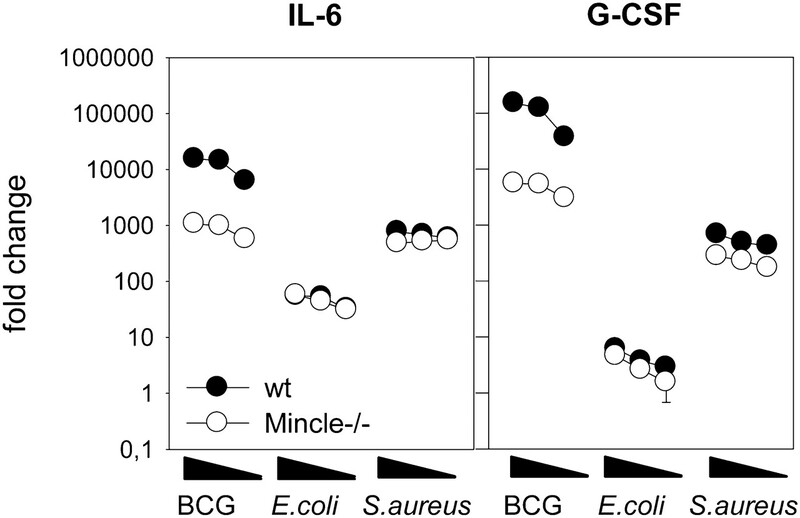 Indeed, Mincle−/− BMM showed a significant reduction in the expression of G-CSF and IL-6 poststimulation with M. bovis BCG that was not observed for E. coli or S. aureus (Fig. 4). Deletion of FcRγ caused a similar effect on the response to BCG, suggesting that Mincle-FcRγ–dependent recognition of TDM synergizes with Myd88-dependent activation by multiple mycobacterial TLR ligands (1) for full induction of gene expression in macrophages dealing with mycobacteria (Supplemental Fig. 6). Mincle−/− macrophages have a defect in the response to BCG. BMMs were stimulated with live bacteria for 24 h at multiplicity of infection of 30, 10, and 3, followed by preparation of RNA from the cell lysate. Expression of G-CSF and IL-6 was analyzed by qRT-PCR. Shown are mean and SD of quadruplicate samples from a representative of two experiments. The data presented in this study show that Mincle is a pivotal receptor for the mycobacterial cord factor, entirely in agreement with the findings of Ishikawa et al. (23) published during the review process of this paper. It should be pointed out that additional receptors may bind TDM independently or in cooperation with Mincle. Candidates include other CLEC proteins, such as Dectin-2, which also associates with FcRγ, is expressed in macrophages, and binds to M. tuberculosis (24). The scavenger receptor MARCO interacts with TDM, yet lacks an intracellular domain for signal initiation (25). In contrast, Mincle can directly trigger Syk-Card9 signaling via its association with FcRγ. The impaired macrophage response to mycobacteria in the absence of Mincle raises the question about the function of Mincle and the subsequent Syk-Card9–dependent response for the control of mycobacteria in vivo; cord factor recognition by Mincle may be beneficial for the host by increasing cytokines and antimicrobial effector molecules, but a downregulatory role (e.g., through G-CSF and IL-10) also seems possible (26). Our data reveal the molecular mechanism underlying the Th1/Th17 adjuvanticity of the glycolipids TDM and TDB. The identification of Mincle as the TDB receptor provides the target structure for this promising snythetic glycolipid adjuvant that has entered clinical studies for tuberculosis subunit vaccination. These results also suggest new possibilities of modulating vaccination responses (e.g., by targeting Mincle with specific Abs coupled to Ag) as a dual function receptor for Ag delivery and APC activation. The technical assistance of Katrin Jozefowski is appreciated. We thank Dr. Christian Bogdan for critical review of the manuscript and Manfred Kirsch, Melissa Wojak, and Verena Laux for help with mice. Disclosures P.A. is a coinventor of patents relating to cationic liposomes as vaccine adjuvants. This work was supported by grants from the Deutsche Forschungsgemeinschaft (SFB796, TP B6 to R.L. ; SFB576 to J.R.; SFB643 and FOR832 to F.N.) and the European Union (FP6 TBVAC to E.M.A., P.A., and R.L., Contract Number LSHP-CT-2003-503367), a Max-Eder-Programm grant from Deutsche Krebshilfe (to J.R.), the Wellcome Trust (to G.D.B. ), and The National Health and Medical Research Council, Australia (455947, 597452, and 481945 to C.W.).
. 2007. Intracellular signalling cascades regulating innate immune responses to Mycobacteria: branching out from Toll-like receptors. Cell. Microbiol. 9: 1087–1098.
. 2009. Adjuvanticity of a synthetic cord factor analogue for subunit Mycobacterium tuberculosis vaccination requires FcRgamma-Syk-Card9-dependent innate immune activation. J. Exp. Med. 206: 89–97.
. 2005. Dectin-1 activates Syk tyrosine kinase in a dynamic subset of macrophages for reactive oxygen production. Blood 106: 2543–2550.
. 2009. Dectin-2 is a Syk-coupled pattern recognition receptor crucial for Th17 responses to fungal infection. J. Exp. Med. 206: 2037–2051.
. 2006. Dectin-2 is a pattern recognition receptor for fungi that couples with the Fc receptor gamma chain to induce innate immune responses. J. Biol. Chem. 281: 38854–38866.
. 2008. Mincle is an ITAM-coupled activating receptor that senses damaged cells. Nat. Immunol. 9: 1179–1188.
. 2008. CLEC5A is critical for dengue-virus-induced lethal disease. Nature 453: 672–676.
. 2008. Cationic liposomes formulated with synthetic mycobacterial cordfactor (CAF01): a versatile adjuvant for vaccines with different immunological requirements. PLoS One 3: e3116.
. 2003. Osteopetrosis and thalamic hypomyelinosis with synaptic degeneration in DAP12-deficient mice. J. Clin. Invest. 111: 323–332.
. 2008. The macrophage-inducible C-type lectin, mincle, is an essential component of the innate immune response to Candida albicans. J. Immunol. 180: 7404–7413.
. 2006. Macrophage scavenger receptor down-regulates mycobacterial cord factor-induced proinflammatory cytokine production by alveolar and hepatic macrophages. Microb. Pathog. 40: 171–176.
. 2009. C-reactive protein increases cytokine responses to Streptococcus pneumoniae through interactions with Fc gamma receptors. J. Immunol. 176: 7598–7604.
. 2009. C-type lectin Mincle is an activating receptor for pathogenic fungus, Malassezia. Proc. Natl. Acad. Sci. USA 106: 1897–1902.
. 2007. Mycobacterial glycolipid trehalose 6,6′-dimycolate-induced hypersensitive granulomas: contribution of CD4+ lymphocytes. Microbiology 153: 3360–3369.
. 2006. The carbohydrate-recognition domain of Dectin-2 is a C-type lectin with specificity for high mannose. Glycobiology 16: 422–430.